After IM Lanzarote and a good break from training for a week or so, I failed to hit the post-IM ‘slump’ that people had warned me about. I was still champing at the bit now that I was starting to learn what was required to succeed at ironman racing. Obviously, I wasn’t about to do another full distance event quite so soon, so decided that as soon as I was able, I’d get a few shorter races under my belt. I started with a standard distance race close to home, at Newby Hall and, although I managed to win, I felt pretty lousy. This was frustrating, as a few Wednesday night time trials had shown my legs had some speed, so I was after one more race in June, before having a proper mid-season break. 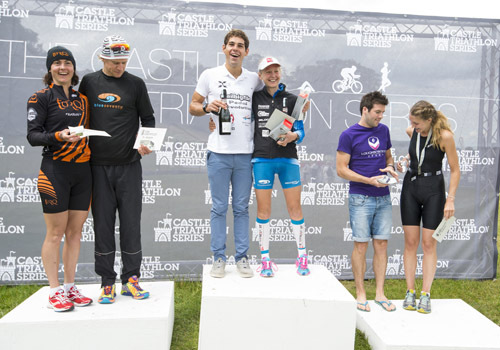 The Castle Series triathlons are something I’d tried last year (Castle Howard was the venue I competed at). This year, they have expanded their events to include middle distance races at each venue, and a really decent prize purse to attract a good quality field. Having grown up in Chester, Cholmondley (‘chumley’) Castle looked like a great setting for a race and it looked likely that the run course might be slightly less tough than the one at Castle Howard. There were a few other strong names on the start list, and I was really up for getting stuck in. On the day, the main competition was Lucy Gossage, who had won at Lanzarote Ironman, ahead of me by a whole hour! My race strategy was to stick to her feet in the swim like glue and then try and limit the damage the best I could thereafter, with the aim of being less than thirty minutes behind. Lucy had had a cracking swim in Lanza, but I felt sure I could keep with her if I knuckled down to it. The swim was a two lap affair, including an exit from the lake, quick run back round to the pontoon and back in. Lucy is such a strong runner that I was ready to sprint if necessary to make sure I didn’t lose her for lap two. I managed it and came out to T1 really pleased. On the bike, my legs took forever to get going. The route was a three lap course, with some flat, some rolling and a couple of little uphill digs. I knew the roads well from my teenage years, bombing around the single track lanes on my hybrid bike, so I felt confident staying on the bars when other might not have done. My dad had come to cheer me on, but after the first lap, I had no idea what he said. Only after lap 2 did I realize he was saying I was only 3 minutes down with a clear gap behind me, and I felt really encouraged to dig in for the third lap. I learned afterwards that Lucy had not had great legs on the bike, but I was pleased nonetheless. On the run, it was hard to push, knowing that I had no threat from behind. However, I wanted to keep the gap as small as I could to Lucy so tried to keep on the pace to see what I could do. There was an out and back section, then up around the castle, with three laps in total. On the out and back, it was great to see Joe Skipper running well (he even managed a little chat with me) and Joel Jameson, and my dad yelling after every lap. The descent down the grass slope to the finish was great fun and I came in a clear 2nd. The whole setting for the race was great, and my dad really enjoyed his day out too. I hope the Castle Series continues to grow. Meantime, it was time for a training break for me and what great timing, with the Tour de France on my doorstep in Yorkshire the following weekend!